I couldn't just spring a contest like this last minute, because many would complain of no notice. Which is an injustice. So waiting a little ( or a lot, if you are excited) is something that must be done in order to hopefully have a good pool of contestants. I hope you are able to participate in the event. I was just being silly. If down to art I become very impatient. I want to increase my motivation to practice my traditional draw skill and those RO drawing contests are really motivated me to do more practice. Yeaah Tati, hope I can participate this one too!!! Amen. include progress shots ? or just the art work itself? My wrist is ready. I'm in. Edited by xskyfish, 19 September 2015 - 12:05 AM. you can if you like. but the final, should be the art it self, Please try and make it big enough for loading screens, as our top 6 will be featured. *smile* that is great! can't wait to see what you have in store for us. If I am around I will try and take part. Sounds fun. I just read about this in the post of RO on facebook and I liked the idea! I will try to participate, despite the time difference. Edited by tatihana00, 25 September 2015 - 04:44 PM. I'm looking forward to the entries. original post has been edited for clarification. Edited by kokeshicat, 25 September 2015 - 05:37 PM. Oh my gosh! One of my favourite maps on the game! I cant fail on this > ! i'm glad that people are excited about this. I really wish you all the best of luck. Architecture, my sworn enemy. :U Guess I'm out. 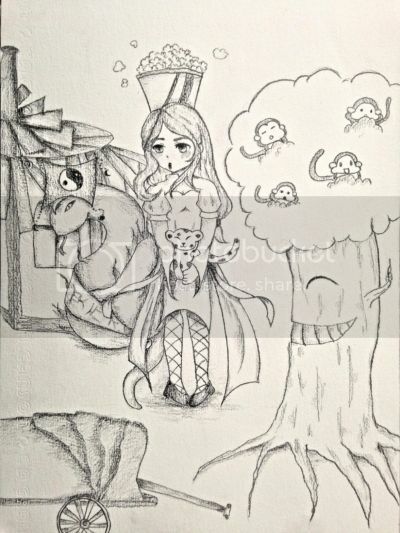 So one fine day.. evil snake lord and enchanted peach tree decided to go out from their usual cave and had out for a stroll~ Bumped to an arch bishop along with her baby leopard, they decided to venture around the Kunlun field. P.S: They had popcorn for their lunch. Edited by angelixity, 30 September 2015 - 05:34 PM. 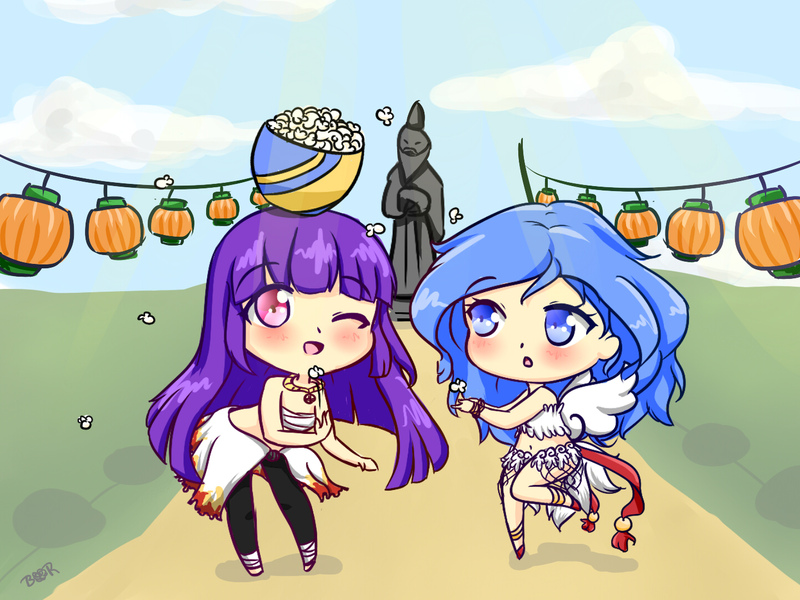 Here is my entry xD just for fun~ *hiding dummy background* Flying popcorn woooooooooooooo !!! Edited by BlueRoseHere, 29 September 2015 - 02:41 PM. Edited by Fratalizite, 29 September 2015 - 10:29 PM. It's my first time in Kunlun today, it was a very interesting place, if I may so myself. I found the Little Prontera quite amusing and came up with this idea. It's Attack on Titan-esque and I had a feeling that Little Prontera felt like a cubby house. Adventure, exploration, and amusement is what this is about! Thankyou to Tatihana for the wonderful experience. Nice art so far everyone! Edited by PhryneRose, 29 September 2015 - 12:34 PM. you need not draw a whole thing out. just something small enough to know that you made it to "little Prontera"
... fingers ready to sculpt/ cut/ *draw/ tear/ weld (oh my!) to the level of completeness that is set by you. @Cranslid - Only the special items and that it is your own work is mandatory, if both of the special items are not included, the art will qualify for winning prize..
Edited by tatihana00, 26 September 2015 - 08:01 AM. Edit: ign SaiIor Mercury on renewal. Blue cute ribbon, thanks! Did something in between work cause I wanted to join anyways. Edited by meli, 30 September 2015 - 10:19 AM.